Ciccheti, kimchi and other things we’re confident were meant for breakfast. There are times when we’re willing to be guinea pigs while a chef experiments, and there are times when we want our Bloody Mary tomatoey, strong, balanced and iced—not shaken, strained and topped with two inches of bitter lemon foam. This is ever-competitive, brunch-obsessed Wicker Park: What’s Storefront Company [Closed] (1941 W North Ave, 773-661-2609) thinking? Let’s calm down and eat something. Because when Storefront sticks to merely enhancing classics with pretty, simple twists, it’s a solid new option in the neighborhood. Batter gets boosted by lemon zest and ricotta for pancakes at once creamy, rich and refreshing, even better with tangy blackberry syrup. The maple is saved for lean but juicy pork sausage links, an ideal side for those lemon-ricotta pancakes. A textbook French omelette is folded around a generous pile of plump hunks of blue crab meat, countered by crunchy shallots and crisp spring greens. But perhaps the most blatant display of Storefront’s kitchen taking the morning meal seriously is the pastry basket: flaky chocolate croissants, buttery brioche, fluffy muffins, and a trio of honey butter, blueberry preserves and a standout pear butter. 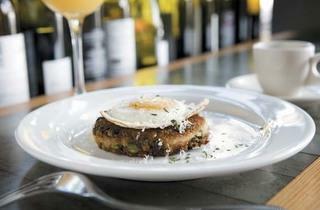 Throw La Colombe coffee into the mix for one of the better brunches we’ve had in a while. Coffee and food are nice. But how do you feel about sun? Would you, come to think of it, kind of prefer to get a suntan than eat one more brunch? We, umm, know the feeling. Which is why we had an instant attraction to Red Door (2118 N Damen Ave, 773-697-7221), the sundeck disguised as an eclectic restaurant, where we didn’t so much want to eat as stretch out with a pleasantly not-too-sweet rhubarb-ginger mojito and an LBJ biography. Still, we ordered: a Lender’s-quality bagel undeserving of the flavorful slices of soy-cured salmon that accompanied it; a slightly chewy bulgogi-glazed hanger steak served with a heap of acidic (but otherwise mild) kimchi, with scrambled eggs thrown in for little more than good measure. The food didn’t do much for us, but between the one-of-a-kind space and the incredibly hospitable service, it didn’t need to. A different server dropped off our smorgasbord, and we found grilled chicken with raisins and…olives, and a huge pile of…olives. Not cool. But our waiter quickly noticed and corrected the mistake, and that’s when brunch at Ombra started hitting its home runs. A large cipollini onion, sliced in half, fell apart into sweet pieces perfect for scooping up crunchy bread crumbs. Eggs tonnato, the spin on deviled eggs that mixes anchovies and capers into the mayo’d yolk, packed a salty punch. Traditional brunch foods? Hardly. And to be honest, this whole dinner-as-brunch trend has annoyed us in the past. (We take this meal very seriously.) 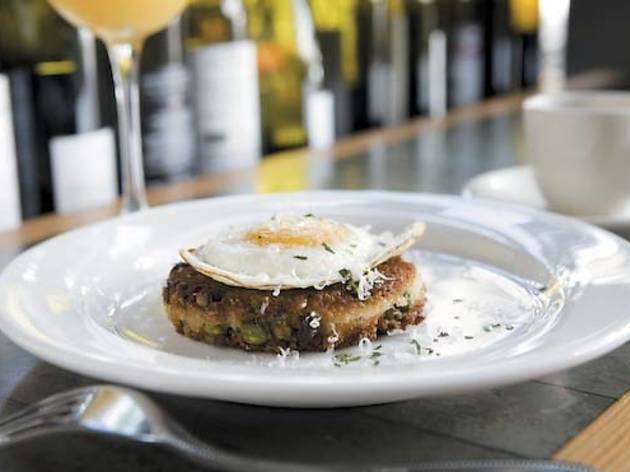 But here, the small, savory portions, teamed with a list of just-for-brunch dishes (get the egg-topped crispy pea risotto cake), prove that when the concept’s done right, you can get used to anything. Except olives.